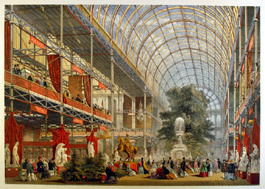 Frontispiece for Dickinson's Comprehensive Pictures of the Great Exhibition of 1851. 2 volumes, 1854. Published by Dickinson, Brothers, Her Majesty's Publishers of New Bond Street. 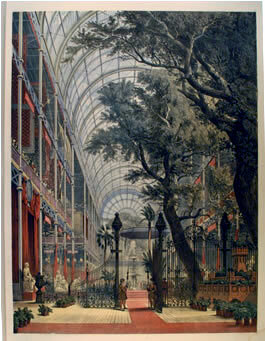 The lithographic illustrations were reproduced from originals painted by Nash, Haghe and Roberts (RA). The sky was described as a cloudless "Italian" blue.